The Sunday prospect report was highlighted by the "Battle of Alberta" between Adam Tambellini's (NYR 2013 3rd) Calgary Hitmen and Griffin Reinhart's (NYI 2012 1st) Edmonton Oil Kings. At stake was first place in the WHL's Eastern Conference and the 2 teams delivered on one of the better junior games witnessed this season. Calgary was spanked on Saturday by Edmonton in Edmonton 7-3 which dropped both teams into an almost virtual tie in the standings so the Hitmen were looking for some revenge. Edmonton drew 1st blood when Dysin Mayo converted a Henrik (Son of Ulfie) Samuelsson feed for a 1-0 Edmonton lead at 13:27. Calgary did not wait long to respond as Adam Tambellini set up Connor Rankin for the game tying goal at 15:52. It was Tambellini's 8th assist and 11th point in 8 games as a member of the Hitmen since leaving North Dakota earlier in the month. 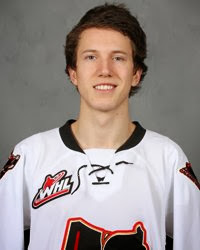 It may be less than a month but it is hard to argue with Tambellini's decision or play. It does make one wonder "what if" Tambellini had made the choice to play in the WHL as a 16 year old rather than in the BCHL in order to attend North Dakota. In any case the teams ended the period tied at 1-1 and in the 2nd period it was Calgary who took the lead in the game with a goal before Samuelsson scored with just 21 seconds remaining in the 2nd period to send the game into the 2nd intermission tied at 2. Edmonton suffered a scare when team captain Griffin Reinhart took a shot off what appeared to be his hand and disappeared for some time in the Edmonton locker room. Reinhart did return and did not look like he was favoring his hand but it will be something to watch during the upcoming week. Neither team scored in the 3rd period despite both teams having several opportunities to score. With both teams picking up a point because of the tie, the game headed to overtime. In the overtime the teams once again traded chances before Edmonton would cash in one of theirs to earn a 3-2 win and sole possession of first place in the WHL's Eastern Conference. Edmonton takes a 1 point lead in the conference standings while also holding a game in hand as they won their 5th straight. Calgary who drops to 3rd in the conference standings will have 1 more game against Edmonton during the regular season but both teams appear on a collision course for the Eastern Conference finals. Anthony Duclair (NYR 2013 3rd) recorded a primary assist on an empty net goal as his Quebec Remparts shutout the Rouyn-Noranda Huskies 3-0 for their 6th straight win. It was Duclair's 33rd assist of the season and his 75th overall point for the young Ranger forward. Troy Donnay (NYR 2013 UFA) had a primary assist to help his Erie Otters edge the Oshawa Generals 5-4. Donnay recorded his 10th assist of the season and 11th overall point when he was credited with the primary assist on Erie's first goal of the game. Teammate Adam Pelech (NYI 2012 3rd) was scoreless as the Otters stopped a 2 game losing streak. Jesse Graham (NYI 2012 6th) was scoreless as his Saginaw Spirit lost to the Guelph Storm 4-2. Victor Crus Rydberg (NYI 2013 5th) was scoreless as his Plymouth Whalers lost to the Sault Ste Marie Greyhounds also by a score of 4-2.